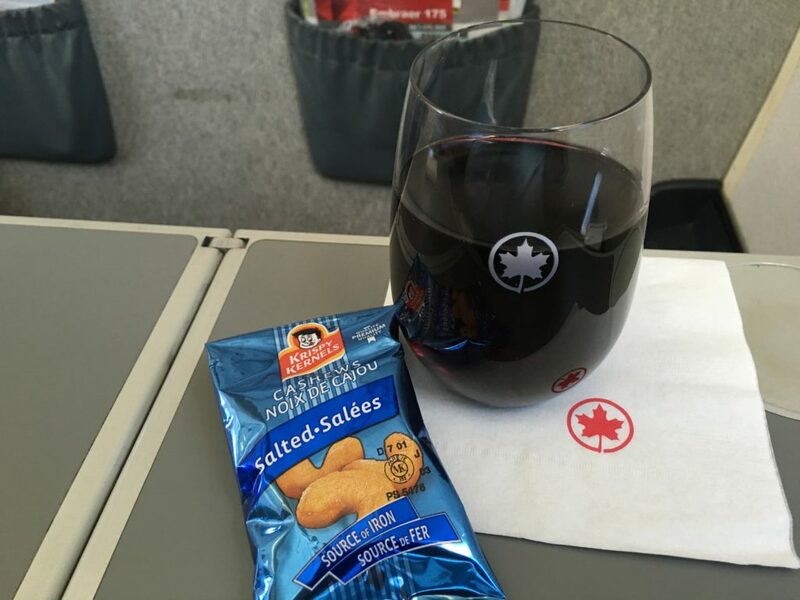 Except for the odd renegade droplet of French Malbec escaping though the side of my quivering mouth (due to major turbulence) flying and dining in Business Class on Air Canada Express and Air Canada Rouge was a much better experience than my usual economy rides to the States. For one thing, the food and drink took my mind partly off the turbulent sky and made it easier to cope with my case of nerves. I think the Fasten Seat Belts sign was on for the entire trip to what turned out to be an even windier Montreal. Don’t get me started on the Montreal landing. I think the Wright brothers had a smoother landing at Kitty Hawk. Air Canada, it must be said, has great pilots. So there we were, spouse and yours truly, ensconced in Business Class and its coveted wide seats (they’re actually about as wide as your boss’s office chair), much wider than economy. Mind you, the best feature of Business Class, for me, was the extra leg room. If you’re long in the leg like me, that extra space really makes a difference. We flew Air Canada Express on the first part of our trip. After being offered a newspaper (unfortunately not The Telegram) we were offered an alcoholic beverage. We chose wine. Spouse had white. I chose the Malbec, a red. It was served with a small bag of Krispy Kernels cashews. They were indeed crispy and fresh. I winced when I saw them, remembering the stale Krispy Kernels nuts I’d purchased once at a gas station in rural Newfoundland. Here’s a tip for you. When purchasing food at rural Canadian gas stations always, always check the best before date. A lunch menu was presented outlining the midday meal we’d be served: salad, entrée, dessert, bread and beverages. We had a choice in mains: Caribbean spiced chicken or cheese ravioli. I don’t like kale. The salad was mostly kale with arugula, fennel, dill and some sun dried tomato. Like an annoying house guest, the kale was loutish and overbearing. It tasted like something we’d be forced to eat, along with jellyfish after global warming’s done its worst. At best it tastes like I’d imagine a house plant tasting after being doused with olive oil and balsamic vinegar. Pasta, especially ravioli, seems to hold up well in this kind of readymade system and cheese ravioli even better. The firm, cheese stuffed pockets held their shape nicely and cheesy flavours resonated along with a creamy tomato sauce. Cubes of roasted eggplant, not the prettiest vegetable when cooked (it was dark grey, like a troubled fall sky), provided some meaty consistency and squash-like flavour for the remaining sauce. Caribbean spiced chicken wasn’t particularly spicy. It did have a delicious herby cream sauce that was a perfect match for poultry. Underneath the chicken and sauce was a mixture of jasmine rice with red quinoa and tiny slivers of carrot. Amazingly, none of this was overcooked and it almost (but not quite) looked as if it had just been plated. 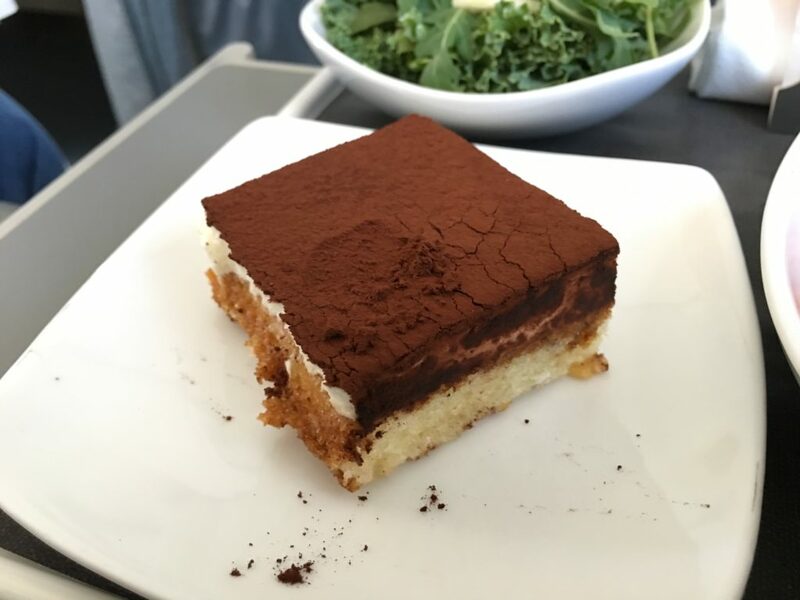 Tiramisù cake (light cake, creamy filling and velvety powdered chocolate topping) brought our in-flight meal to an end. It was less elaborate but no less satisfying than standard tiramisù. Feathery lightness, sharpish espresso flavour, slight chocolate bitterness, and buttery richness were its main qualities. I think the tiramisù cake must be a popular choice because I remember having it several years ago on an Air Canada flight. 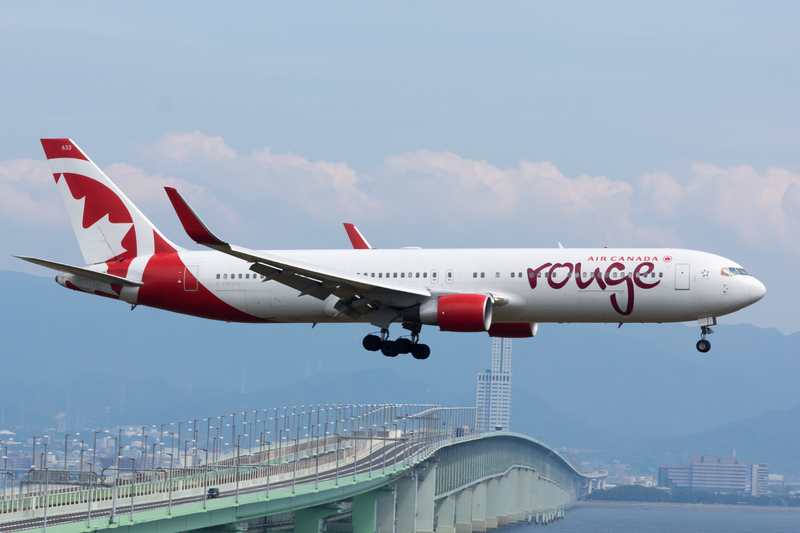 Many hours later we boarded an Air Canada Rouge flight en route to Florida. 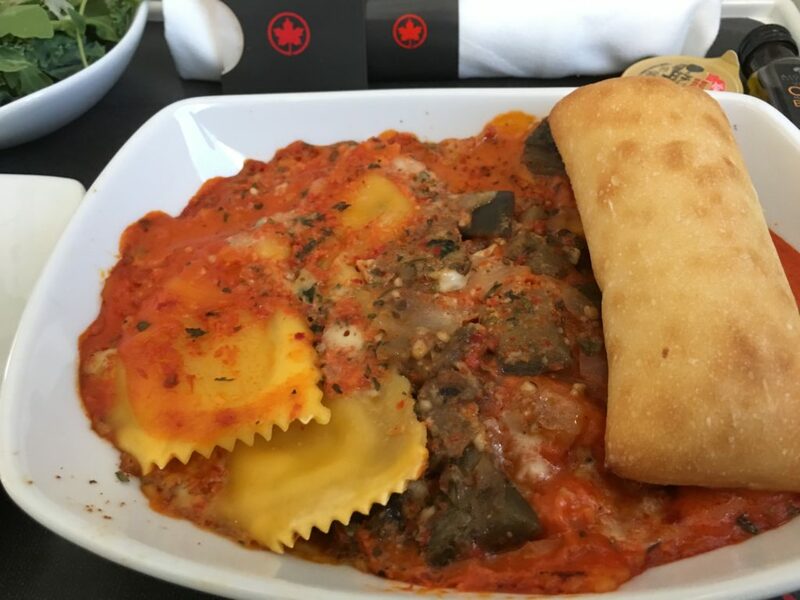 The Air Canada Rouge dinner menu looked much like the Air Canada Express lunch menu, except this time the chicken came in a green curry sauce and the cheese stuffed pasta was tortellini, or was it cannelloni? Anyway, neither of us was interested in a second round of pasta. Chicken in green curry sauce seemed the better option. Before that it was the usual glass of wine, a slightly sweet Italian red called Rosso for me, in a stable stemless wine glass, with cashews. 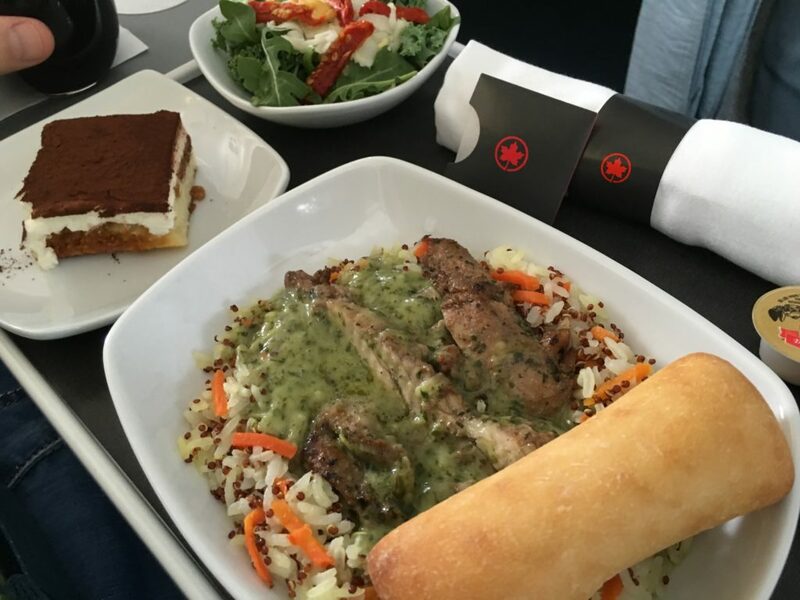 Clearly, Air Canada posh mode had kicked in because the cashews were served, warmed through, in a white, ceramic dish, and not in a shiny, silver packet. Presentation was better but the nuts straight-from-the-package tasted fresher. 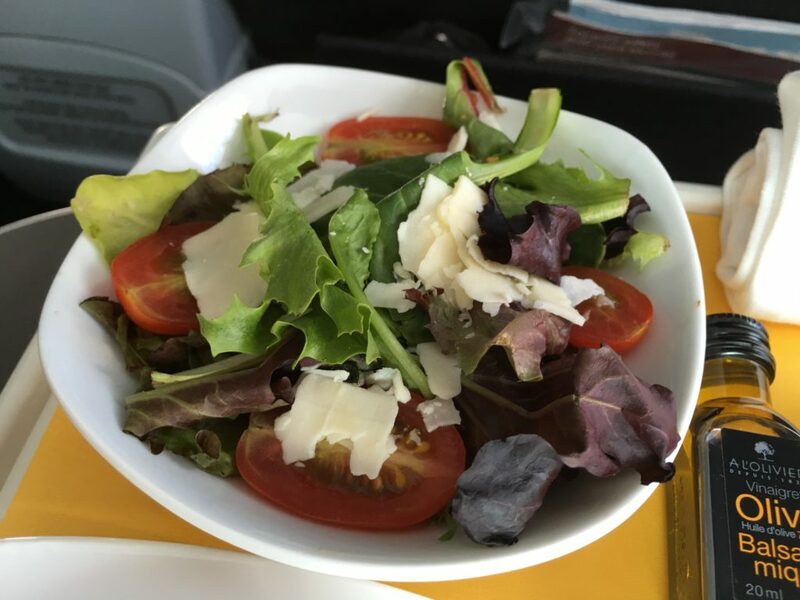 A much more appetizing salad was served on Air Canada Rouge. Thankfully, this one didn’t contain the dreadful kale. That made all the difference. Fresh lettuces (hooray) with ripe, red grape tomatoes, Romano, Asiago and Parmesan lightly coated with vinaigrette was a good beginning. I anticipated a pungent chicken curry, a little more cumin, coriander and perhaps more heat. Maybe spicing has to be somewhat muted when meals are prepared in a food service kitchen and can’t be tweaked for individual palates. 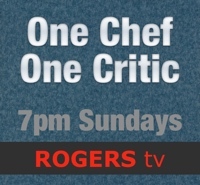 We are talking mass production after all. Presentation, texture and freshness were similar to our lunchtime meal. The rice pilaf, for example, was almost identical. A faulty tray table caused some unwelcome excitement. Just as spouse was cutting, with not much force, into the green curry chicken the seat’s tray table slipped off its anchor point, i.e. the seat divider between us. A full glass of wine (Henry of Pelham Riesling, as I recall) went flying and within a second ended up giving my ankle a thorough bath. Thank God it wasn’t scalding black coffee. If it had been, I would have been limping off the plane in pain from a nasty burn. It was obvious, from the scratches on the side of the divider, that the tray had slipped on many previous flights. We reported the problem to a flight attendant. I hope some paperwork went in about it and I hope it gets fixed before someone receives a serious burn. Boring, standard vanilla cheesecake with strawberry swirl replaced the commendable tiramisù from the lunchtime flight. It was good but no more exciting than the cheesecake you find in the frozen desserts section of your local supermarket. Although our second flight had its moment of drama (with a hurtling glass of vino), at least the second landing was cushion soft. Soft for Business Class and, of course, soft for everybody flying in economy (I’ll be a pumpkin back there soon enough). But I had had more room (and more physical comfort), more service and also that memorable Business Class tiramisù. So, yup, when I save enough points, I may just try those wide seats again.